This holiday home, typical former farmhouse of this region, is situated in the beautiful Itria Valley, between Cisternino and Ostuni. 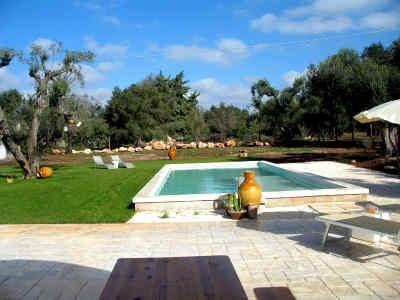 This rural location is perfect for your Puglia vacation with your children romp omitted here and can play. The lovely trullo has cozy interiors that are furnished in rustic style. You will find a living area with fireplace and an open kitchen, two bedrooms, which are accessible from the living area and separated only with a curtain, as is so typical of the Trulli, as a shower room. Outside there is a large terrace, a part of this is covered, furnished and can be wonderfully used as a relaxation zone. The quiet and sunny location of Trullo promises a pleasant stay, ideal to forget the everyday life and to enjoy your Puglia holiday in this beautiful place earth. We recommend day trips to Alberobello (Trulli Village), Polignano a Mare (a small charming seaside town), Ostuni, Castellana Caves etc.For swimmers there is a 800 km puglian coast completely at your disposal, and you can choose between sandy beaches, dunes and beautiful creeks. Price includes water, gas for cooking, bed linen, towels, electricity, final cleaning. Pay locally: refundable deposit € 100.00, wood according to consumption.